I can’t quite remember where I picked up this record – I have a slightly guilty feeling that it was ‘borrowed’ from my friend Simon some time ago and that I never got around to returning it. And now, hell’s bells, he lives entirely in the middle of nowhere – well, Wales, but deepest, darkest Wales – and I rarely see him. Let’s just agree that I’m keeping the record safe for him for the time being. Planet Records was always an enigmatic label – their releases seemed immediately hard to find and had a mysterious quality that reinforced each one as a special event. Crescent released at least a couple of singles on Planet, and were in some ways the perfect act for them. They’re deeply mysterious, perhaps (I seem to remember) something to do with Flying Saucer Attack, and the blurry, creepy photograph that adorns the sleeve here reflects the blurry, creepy music they make. 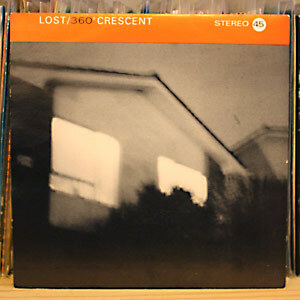 On one level Crescent are a simple rock band, in the vein of Spacemen 3 or Loop or even Mudhoney – garage-punk riffs and fuzzed-out guitars – but in the same way as Flying Saucer Attack used to do, they drape their sound in a combined mist of lo-fi recording and paranoid soft-edged bleed between instruments. This sounds like it could have been recorded on a crappy tape deck during a band rehearsal, and it’s all the better for it – upping the recording quality rarely equates to upping the mystique and personality of a band. I remember an old fanzine running a great article about Planet Records way back when. It may have been one of the artful works of Dickon Edwards, and it may have been called ‘Every brush mark is torn from my body’, or a similar quote from Tony Hancock’s The Rebel. I’ll have to see if I can dig that out.